I have to admit it, when my wife Rose was pregnant with our first son, Grant, and she (like 93% of the women who buy a book about pregnancy) toted around What to Expect When You’re Expecting, I had ZERO desire to crack it open and start digging in. Call me your typical irresponsible dude, but I thought we’d figure out this kid thing as we went along. After all – how hard can be, said the naïve first-time Father. Fortunately for me, Rose was more thoughtful, mature and sought out good advice to prepare for our ‘baby.’ Grant’s now 24 years old. Where did the time go? Even though I’m normally a preparation maniac, when it came to our first-born arriving, I was winging it. Now, I’m a ‘little’ older, and hopefully wiser. Today, I do see the value (and/or the pain of not having) a vision or a plan – whether it’s with a new-born, or a custom closet design. In the home organization business, I’ve seen how poorly planned closets turn into scary, messy places. On the home front, I’ve seen the value in talking through important decisions with my wife as we ‘try’ to navigate the messy waters raising our ‘3 little angels’ (OK – I lied about that – ha! ha!). I see closets with a single rod and shelf with massive dead space above and below your clothes. I see closets with ‘Bermuda-triangle’ corners with clothes overlapping clothes creating a useless corner. I see a closet with no place for your all-important shoe collection, so they’re stuck buried in the dark, deep crevices of your closet floor. When you move into a larger new home or downsize into a smaller space, you’re expecting your new ‘digs’ to work better than your old one. However, this is seldom the case when it comes to closets. They’re frequently the over-looked red-haired stepchildren (with no disrespect to you red-haired stepchildren out there) of the home buying process. That is …until you move start moving in. Then you find the homes’ storage ‘solutions’ are a disaster. In this article my goal is simple. 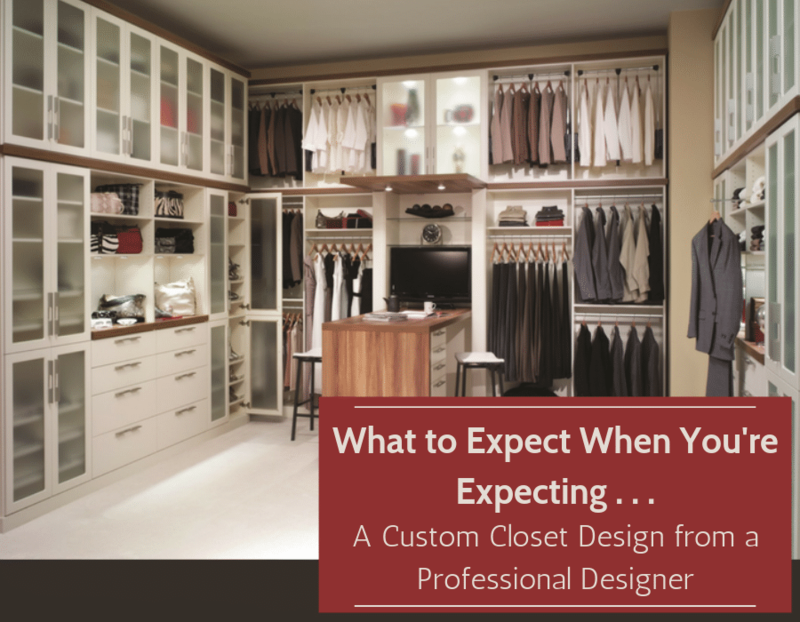 I’m going to present 9 practical expectations you should have if you work with a professional closet designer who is going to help you develop a game-plan for your closet. Let’s check out these 9 expectations. 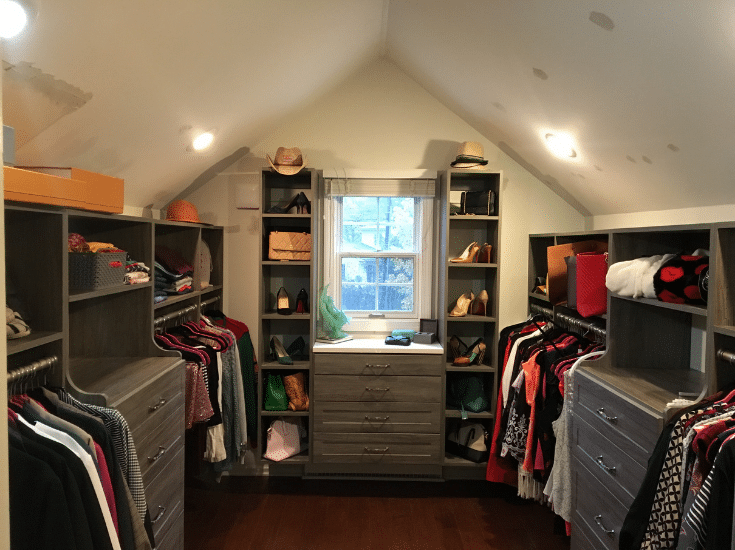 As with any designer (whether it’s your interior designer, building designer or landscape designer), your closet designer should be a professional who can offer you vision of how your space can not only look good but work well also. You should expect an effective closet designer to talk about how to maximize your ‘feature wall.’ A feature wall is the most visible wall in your closet. 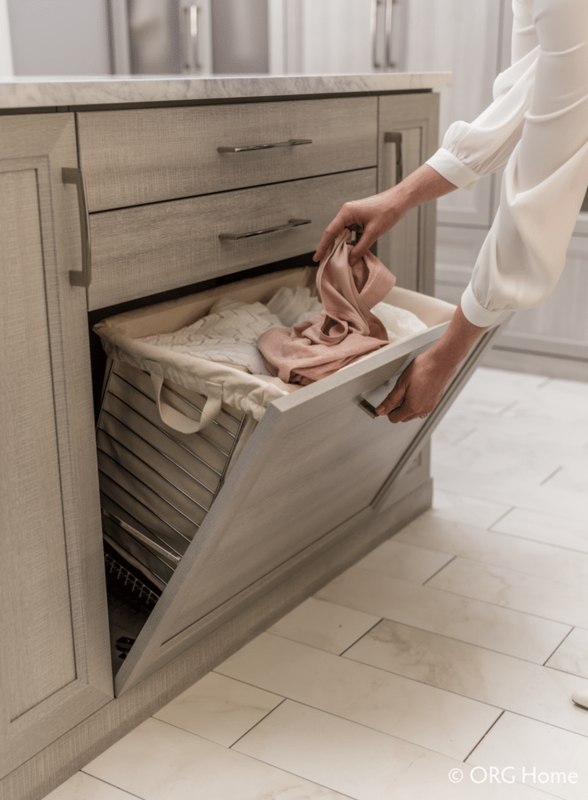 You designer may suggest useful options like drawers, or valet rods to stage your clothes or counters to set things down. 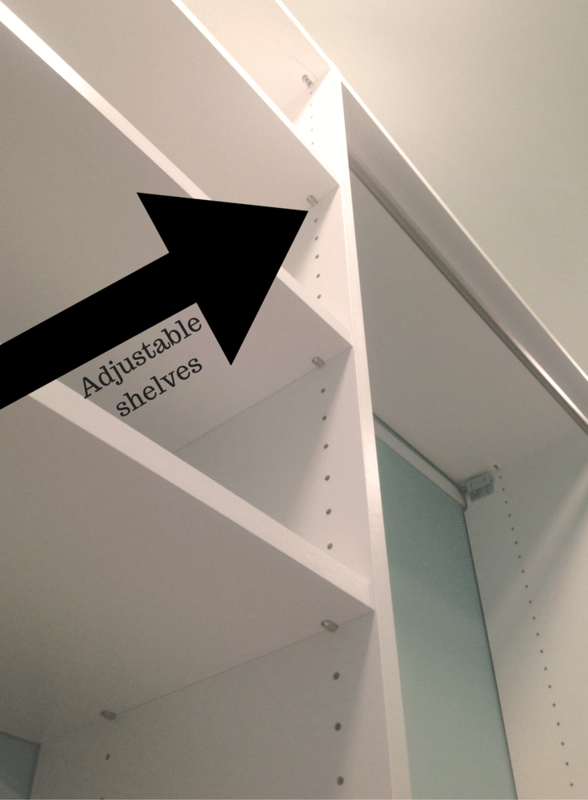 These features not only can make your closet look nicer but live better. 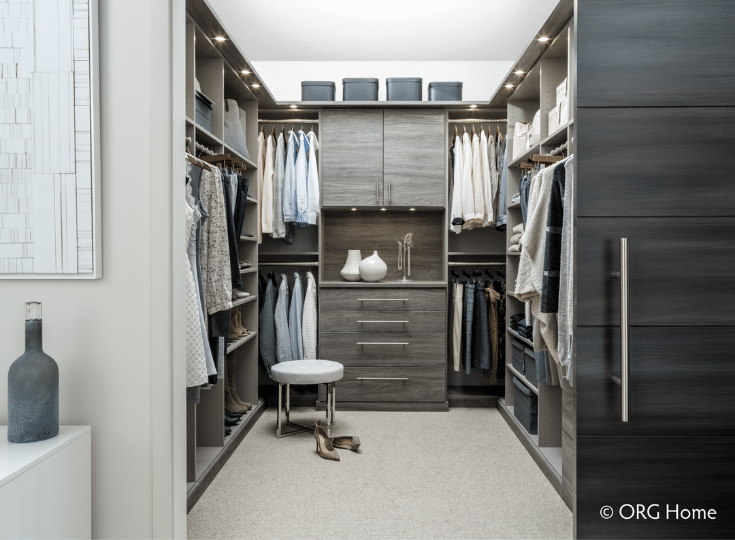 You should expect your closet designer to have a vision (a game-plan) on how to take a narrow closet and make it feel more open (by moving hanging clothes away from the door opening). You should expect your closet designer to have a vision on how to ‘display’ your shoe collection on raised shelves (if you have a spacious walk in closet), or how to efficiently store them in a reach in or small walk in closet on flat shelves. Do you share a closet with your spouse or partner who, if we’re being brutally honest, is a slob? You know their ‘neatness’ habits make using this space stressful for you. Their clothes and shoes haphazardly thrown on the floor. There’s no ‘dividing line’ separating their mess from your stuff. Your closet feels like one big, hot mess. The good news is…you don’t have to live like this. Get practical tips from your closet designer to end this madness. 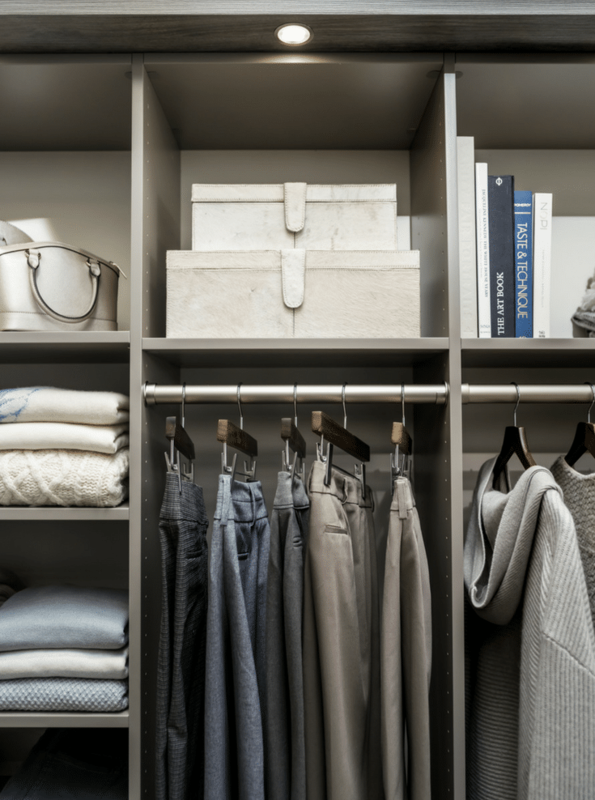 One way to get your arms around this challenge is to read Storage Wars: 7 Essential Tips to Win the Battle of the His and Hers Closet. Not all people are created equal. You may be saying, “Mike, it doesn’t take a genius-closet-designer to figure that one out,” and you’re right about that. However, when it comes to bad closet designs everyone is treated like they’re the same. There is ZERO flexibility and adjustability in cheap wire or stationary wood closet systems. Since they have no adjustability, the design assumes ‘one height’ fits all. It does not. This lack of flexibility is a problem. If you’re V.C. (vertically challenged) you know what I’m talking about. Expect adjustability (through the use of spacing holes on the sides of your closet support system). Refuse to accept a ‘one size doesn’t fit all’ closet any more. Would you ‘go under the knife’ for heart surgery from any old guy/gal who wasn’t an accredited heart Doctor or a member of the American Medical Association? I doubt it. Then, why hire a closet designer who isn’t a member of the industry professional association (The Association of Closet and Storage Professionals) and attends conferences to stay on top their game? You deserve to have a closet professional who is a professional in their industry. It’s hard to be a progressive designer without rubbing elbows with the ‘best of the best’ around the country while attending industry conferences. You’ve got an angled wall you don’t know what to do with. You’ve got a dormer ceiling and desperately need more space. You’ve got a window in your closet and don’t know how to work around it. These situations are exactly the reason you’ll want a closet designer whose been ‘down the road’ before. While these situations are unique to you, a well-versed designer will have ideas to work around these challenges (and even make these oddities special). Let’s face it, you and I are creatures of habit. Some of our habits are good. Some are not. When you were little Mom harped on you to hang everything up in your small reach in closet. While this was a good habit, what you may not realize is ‘hanging everything up’ is not always the best (and most efficient way) to store your shirts, t-shirt and pants. For example, did you know you can get 2 to 3 times more clothes stored folded upright in a drawer than on hangers. Or, did you realize rolling your ties takes away their shape. Or, using random hangers makes your closet look messy. You should expect insight from a closet designer who isn’t afraid to tell you like it is, even if they know you’ll need to change your storage habits. Can it be hard to change habits? You bet! However, the prize can be an organized closet you’ve never experienced before. It only takes a few clicks through Pinterest to start drooling over what you’d LOVE your closet to look like. Inspirational closets are fun. However, sometimes you need to fit your 40 pairs of shoes into a small walk in closet. A Khloe Kardashian-esque closet with raised shoes shelves simply isn’t in the cards. Your closet designer needs to be practical. They need to help you balance between your wants and your needs. 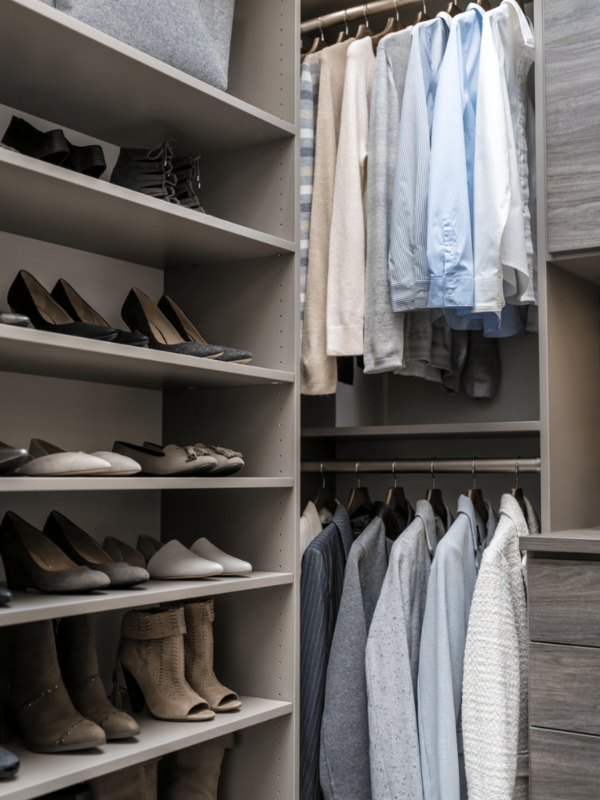 They need to be your voice of reason – so you get a finished product which not only looks nice, but functions well within your space and budget constraints (oops – sorry to bring up money when you were drooling over the vision of your beautiful closet). A good designer will help you determine if you can fit a hidden hamper, drawers a mirror and a place for luggage. A good designer will help you to express your wants and your needs. They’ll help distinguish between what you need to do vs. what would be nice to do (money permitting). The closet industry has changed dramatically. Now you’ll find textured laminates which look and feel like wood (without the warping and maintenance of wood). There are lighting options which don’t require outlets. 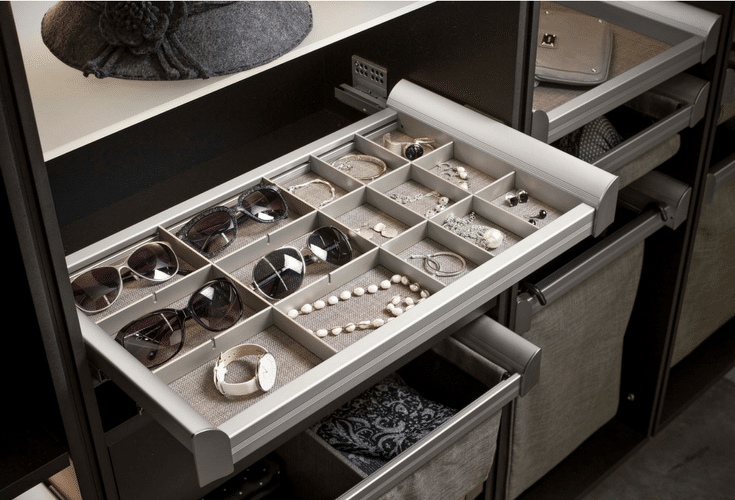 There are jewelry drawer trays where you can move compartments to fit your specific items. Insist on a designer whose is knowledgeable about what’s hot, and what’s not. There’s a jungle of new products out there. Let a professional closet designer help guide you to the best options for you. Expectation #9 – Enjoy the ability to see (and price) your design in 3D. Most people don’t see (or understand) two dimensional drawings – unless they’re in the building or architecture business. However, it’s important to experience (to feel) how a closet design will live and look before you buy it. This is where 3D closet design is critical. With today’s design programs, you’ll not only be able to see what you’re getting (before your order), but you’ll be able to add, subtract and reprice the design ‘on the fly.’ This design and pricing flexibility put you in control of balancing between the coolest design you’d love and the one you can afford. Whether you’re expecting a child (which after 24 years of raising 3 kids I’m still trying to figure out), or planning a custom closet, it’s still smart to get professional insights to help you through the journey. 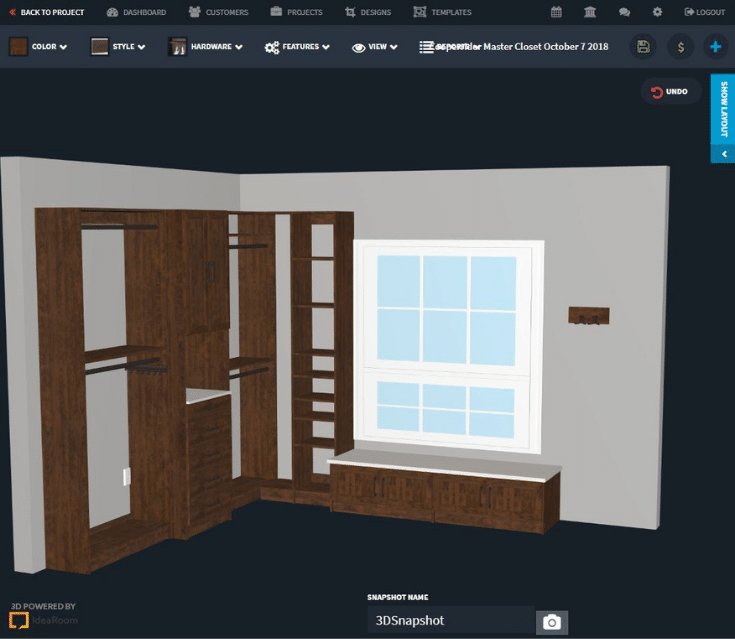 If you’d like a Free 3D design for your reach in or master closet in Columbus or Cleveland Ohio, me (and my team) would love to help. Feel free to click on the links or call the numbers below. If you’re expecting a baby and looking for insight – I’ll recommend you get What to Expect When You’re Expecting. After 24 years, I’m still trying to figure this parenting thing out. I’ll stick to the closet design guidance if you don’t mind (raising kids is just a little bit harder than figuring out your closet – IMHO). For assistance with a reach in or walk in closet in Columbus or Cleveland Ohio call Innovate Home Org at 614-545-6888 or 216-658-1290.